The furnaces that blaze in the glasshouse at Whitefriars have been burning unquenched since 1680. In keeping with the many traditions of this ancient craft, a brazier from the old works in the City of London was carried to Harrow to ignite the first furnace in the present Wealdstone glass- works when the move to the new factory was made in 1923. The first home of the Whitefriars glassworks was near the legal Inns of Court in the Temple and beside the River Thames. As the name indicates, the site had originally been a monastery of the Carmelite Fathers, whose white habits made the monks known among the populace as the White Friars. Today, a small symbolic White Friar travels the world as the trademark on the firm's hand-made crystal, exported to all the many parts of the globe where British craftsmanship is esteemed. . 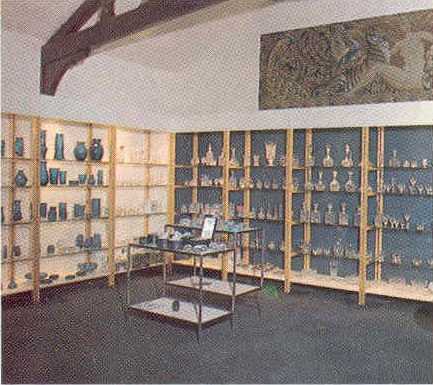 It is known that the ancient Egyptians made glass, of which examples survive, and Pliny the Elder told the Roman world that the Phoenicians had discovered glass accidentally in the ashes of a sailors' camp fire on a beach in which a form of soda, used to prop up their cooking-pot, had fused with the sand in shapeless lumps of glass. The first book on glassmaking was compiled in the thirteenth century by one Theophilus, a monk if not a White Friar! The basic skills remain the same, as you will see them practised at Whitefriars today, but over the centuries glass technology has developed into a complex science, with its own professor and faculty at, for example.. the University of Sheffield. The raw materials needed to make glass are essentially sand, red lead and potash for lead crystal, and sand, soda and lime for soda glass. The sand is very special for it must be free of all impurities: that used by Whitefriars is brought from the continent and is the best in the world. The silver sand is washed, sifted and dried before being mixed with the other ingredients, to guarantee that consistently brilliant white colour which is the hallmark of English crystal glass. All these ingredients, known as the 'batch', are melted in fireclay melting pots, arranged in a circle in the furnaces that nowadays are fired by North Sea Gas. The pots themselves are fashioned with great care by hand. When ready each will hold up to 18 cwt. of molten glass, but must first mature for at least six weeks in store under controlled humidity and temperature. Pots last about fifteen weeks in the furnace, where they endure a constant temperature of around 1400 degrees Centigrade. Thirty pots are always in use in the glasshouse, having been preheated under very strict control in a special oven called a pot-arch for five days. Putting a new pot into the furnace is a very exciting business. The men dress in their oldest clothes which, at the height of the pot-setting operation, often smoulder under the intense heat. Replacement of a pot becomes necessary when its inner surface is attacked by the molten glass. The present-day Whitefriars multi-pot furnaces comprise eight or ten melting-pots set around the periphery of the circular furnace. Once lit, a furnace is never extinguished during its lifetime, which may well be over twenty years, although individual pots are replaced at frequent intervals. In earlier times wood was used to heat the furnaces. There was a switch to sea coal in the eighteenth century and mined coal was used by the stokers until the 1930s, until the change to natural gas in 1977, oil was used as fuel for many years. The temperature of 1400°C is maintained 24 hours a day, 52 weeks of the year. The teams of men whom you will see withdrawing the 'gathers' of molten glass from the pots for working have duties and titles almost as ancient as the craft itself The 'footmaker' gathers the glass, an operation demanding considerable skill, as precisely the right amount of glass must be taken out on the end or nose of the 'blowing iron', the glassmakers' principal tool. The 'footmaker' then 'marvers' or rolls the glass on a mirror-smooth iron slab, and the first rough shaping takes place. The 'servitor' then shapes, blows and tools the glass further before handing it to the 'gaffer' (a word that has passed into the English language to denote 'the boss'), to be finally developed. The movements of the true craftsman are methodical but always rhythmical. The creation by such a team of a wine-glass, bowl or vase is a graceful, seemingly effortless operation which requires a very high degree of skill. After the craftsman has finished his expert attentions, each piece of glass must be cooled under precisely regulated conditions in a tunnel kiln known as a lehr, in which it remains for four hours. Were it not for this treatment, known as annealing, no glass would ever leave Whitefriars: sudden cooling could shatter all the items into tiny fragments because of uneven strains and stresses imposed during working. As may be expected, footmakers, gatherers and servitors have a language all their own. The 'glory hole' is a small furnace for reheating glass during shaping. In the glassworks can be overheard such titles and terms as 'pontee', 'rig-a-ree', 'marese' and 'frigger'. 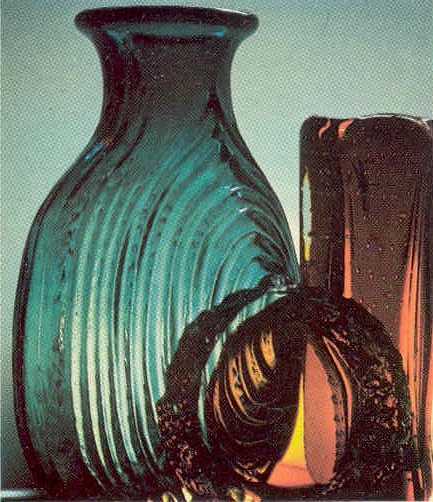 'Pontee' signifies the scar left on the glass where it has been held by the blowing iron; 'rig-a-ree' is a form of decorative strapping; a 'merese' is a glass button, usually between the bowl and stem of a wine-glass; a 'frigger' is an artistic trifle worked in glass by a glassblower in his spare time for the amusement of his friends or as an experiment. Apart from the central glasshouse itself, the cutting room is the principal repository of traditional skills at Whitefriars. Cutting of glass in order to release the internal reflections of light has a history almost as long as that of Whitefriars itself. For example, in the eighteenth century, William Parker, to whom Whitefriars supplied blanks for glass-cutting, as was then common practice, cut the famous chandeliers for the Bath Assembly Rooms. Two hundred years later the chandeliers were reconditioned at Whitefriars and still glisten today in the world-famous spa. The cutters make rough cuts with a carborundum wheel before a finer wheel smooths the surface and perfects the pattern. Dipping the glass in an acid bath restores full brilliance to its surface. Modem electric lathes now turn the cutting wheels, but the dexterity needed to manipulate the glass against the wheel is as great as ever it was. English full-lead crystal had its origins around this period with the invention by Ravenscroft in 1676 of glass containing lead which was the origin of the now famous English lead crystal. The patent for this glass was released to other London glasshouses in 1685, the year of King Charles II's death. The ground that Pepys and his party trod was already steeped in history, but was not chosen by the glassmakers for that reason. More important to them was the easy access to the Thames-side wharves from which sand, clay, coal for the furnaces and other materials could readily be transported even in those days of unpaved roads. There is still a Whitefriars Street off Fleet Street, and the site of the original glassworks was near where the Daily Mail has its offices. The area was not always so respectable, for when the monastery of the White Friars, founded in 1241, was dissolved in 1538, after Henry VIII had quarrelled with the Pope over his divorce, the King did not repeal the ecclesiastical law of Sanctuary. The area therefore remained a place of refuge for fugitive debtors. But, alas, the law also held good for cut-throats and murderers, and, as a result, the district, which thus became known as Alsatia, was squalidly overcrowded, and so continued until 1697 when Parliament repealed the right of sanctuary. On another occasion the same cavalier treatment was meted out to an Excise Officer who came to collect the duty at that time levied according to the weight of glass produced. 'The brandishing of blowing irons headed with red-hot glass' gave a hint to future generations of how best to treat income-tax demands. Long before the days of mammoth take-over bids, Whitefriars changed hands several times. The family of a Captain Seal, who had acquired the works in 1733, held it until 1763. In 1765 a certain Carey Stafford was running the works and did so until he died in 1778, when he was buried in St. Bride's, now the Pressmen's Church, nearby. Next, a family named Holmes operated the works for fifty-three years, until the famous James Powell took over in 1834. The firm traded under the name of James Powell & Sons for five generations and well over a century, reverting to the original Whitefriars Glass Limited in 1962. Under James Powell interest in coloured glass dawned in 1850. A Victorian barrister and archaeologist, Charles Winston, had investigated the properties of medieval stained-glass, analysing the colouring agents used in the Middle Ages. He persuaded Powell to produce such glasses, which was done most successfully, and since that time thousands of formulae for lovely stained-glass colours have been developed at Whitefriars. Examples of materials used to colour glass are: Iron compounds, producing pale yellow or green; Copper, green, blue or ruby; Cobalt, strong, deep blue; Manganese, pale green or purple; Selenium, ruby or golden amber; Gold, ruby; Nickel, brown or violet. There are Whitefriars windows reflecting the glory of God in cathedrals and churches all over the world - from St. Paul's Cathedral, London, to St. Thomas's, New York; from Wellington Cathedral, New Zealand, to the great twentieth-century Anglican Cathedral of Liverpool, and village churches throughout the shires of England. Stained glass windows are no longer made at Whitefriars, but the Works museum houses designs created for many of these important churches. Examples of techniques of past generations are exhibited, together with displays of some of the methods and tools used by the craftsmen to create the stained glass art during the 140-year period that the craft was practised within the Company. In the early days Burne-Jones and Rossetti were among those interested in the stained-glass work of Whitefriars. Designs by other well-known stained glass artists are also exhibited. This interest in coloured glass led to the creation of tesserae for glass mosaic work. For instance, the interior of the morning chapel, of the choir and of the dome of St. Paul's were decorated with mosaic by Whitefriars craftsmen. Whitefriars, never resting on their historical laurels, have been ever ready to experiment.. In the nineteenth century they were involved in producing special colours for sparkling glass eyes. Experiments in toughened glass were carried out; miners' lamps were made for Mr. Plimsoll, whose other safety device still 'lines' and safe- guards world shipping; vacuum Basks were developed; bulbs for incandescent electric lights were once made in some quantity; war-work provided a grim alternative to the aesthetic tasks of peace - glass horns to explode sea- mines were developed during the Kaiser War; optical glass was produced for gun sights. Glasses with special characteristics required for thermometer tubing were compounded and the unique post-war 120-ft. tower for drawing such tubing is still a landmark at Whitefriars. Today Whitefriars remains a leader of the industry recognised for inspired design and subtle turn of colour. Employing methods that Pepys would have recognised in conjunction with the effective use of modern machinery where such can be introduced without loss of craftsmanship. Whitefriars produce beautiful objects to delight the world, undreamed of in seventeenth century England. New shapely designs and advanced colour treatments devised by the Company's chief designer Geoffrey Baxter, DesRCA, MSIA, are regularly being introduced to enrich modern living, whilst at the same time perpetuating the craftsmanship and tradition of the past. Training young men in the skills and intricacies of glass-making and cutting is given pride of place by the company's management who jealously protect and foster the art of producing fine hand-made plain and cut glassware. Limited editions of hand-engraved commemorative goblets to mark such notable occasions as the Queen's Coronation, the Investiture of the Prince of Wales and Her Majesty's Silver Wedding, contrasting with a wide and varied range of glassware for everyday use, are a typical cross-section of the production line in the contemporary 'GlassHouse in White Fryers', which continues to employ age-old skills to satisfy modern fashion and society. Changing fashions have always dictated different styles of design. The flexibility of production techniques which are available at Whitefriars has enabled the Company to adapt to these gradual changes in public demand. The present trend towards a return to traditional elegance and luxury has resulted in an increase in demand for Whitefriars quality hand cut English full lead crystal which is made entirely by hand requiring a high degree of old-fashioned craftsmanship and skill which have become part of the ancient history of Whitefriars. The variety of hand cut crystal designs currently available covers a wider range of alternative shapes and patterns than ever before. Some designs are based on pieces in the old Whitefriars pattern books; the methods of production are unchanged since the drawings were made 100-150 years ago. Since 1840 Millefiore paperweights have provided a challenge to glassmakers throughout Europe and many of these items have now become valued collectors pieces. 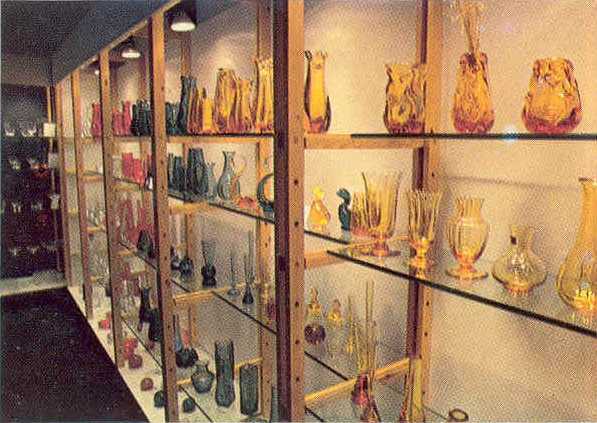 A renewal of public interest in paperweights during the 1950's coincided with the development at Whitefriars of new colours and new techniques for making millifiore cane. This development and improvement in techniques has continued to the present time and has resulted in Whitefriars modern limited edition paperweights. These are enthusiastically sought after by collectors all over the World. Special commemorative issues have been produced for such occasions as the centenary of the sailing of the 'Mayflower' to America, the Bicentenary of the American Declaration of Independence and the Olympic Games 1976. The Silver Jubilee of H.M. Queen Elizabeth will also have limited edition paperweights produced to mark the occasion. Whitefriars were also proud to introduce in 1975 the first of an annual series of a Christmas Millefiore paperweights. Millefiore paperweights are hand-made throughout in full lead crystal and all of the work from the melting of a wide range of special colours, the manufacture of the glass cane, the complex hand-setting of the patterns to the completion of the paperweight by cutting or faceting the surface is carried out within the factory at Wealdstone. It is possible to recognise a genuine Whitefriars paperweight from a minute Whitefriars monk trade mark symbol within the setting of each item produced. The year of manufacture - important to the enthusiastic collector is also incorporated indelibly within each paperweight. The above information is an account of the history of Whitefriars, published by Whitefriars in 1976. Showroom Pictures from the Whitefriars Showroom.